This sport watch from Casio packs a lot of power without the face clutter typical of many chronographs. An elegant bluish-purple dial with luminous white stick indexes and hands is housed within a resin stationary bezel. 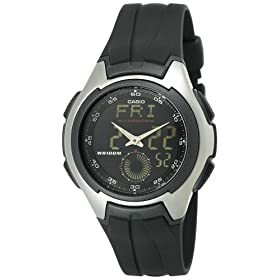 Featuring analog/digital time and 12/24-hour format, this timepiece also includes a 30-page databank, three daily alarms, and an auto-calendar. Presenting on a stainless steel band and powered by a quartz movement, the watch is water resistant to a depth of 165 feet.